Recommended ship classes: Battleship, Command Ship, HAC. 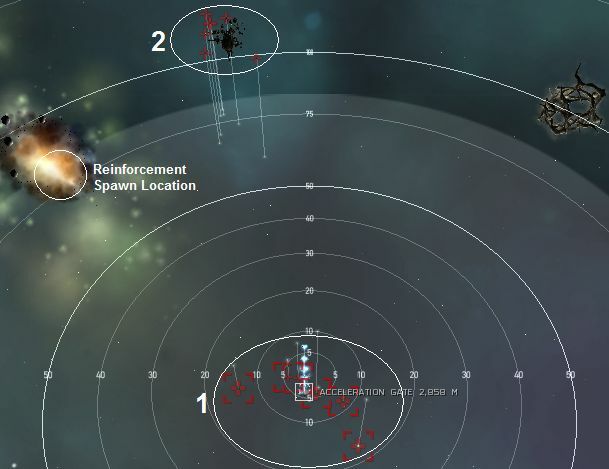 Spawn triggers are the highest bounty battleships in a particular group. Their names will randomly change, so be sure to identify them correctly via their bounty. Auto aggro from 1st group. 2nd group and spawn will aggro drones. There's fleet aggro in this pocket. First pilot to warp in will get the aggro from the 1st Group, but no aggro from the 2nd Group. 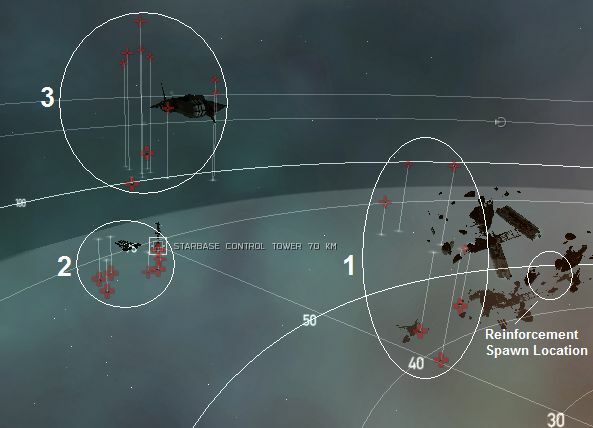 Remaining fleet members who warp in later will receive aggro from 2nd Group when they start to open fire on the 1st Group. Attacking the 2nd Group will aggro the 3rd Group. Reinforcement spawn will aggro drones. Auto aggro. Last ship triggers spawn. 1st Pocket: warp through the gate without killing anything. 2nd Pocket: eliminate all ships in Group 3. Warp out. Destroying the Starbase Control Tower will prevent reinforcement group from appearing. It will however, aggro Group 2 in the process. Recommended order of elimination: 1st, 3rd and finally 2nd group (also including reinforcement spawn when triggered). Mission is flagged completed once you have eliminated all ships from the 3rd Group. 1st Pocket: 60 Veldspar asteroids (100- 130km, 2,402,354 units). One Habitation Module drops 10 each of 2 low value trade goods.